Makiwara is a punching board. It is a piece of equipment essential in toughening the hands, strengthening the wrists and giving training in hand techniques. A makiwara consists of a straight board with the top portion fitted for punching. The board itself is made from a seven or eight foot long four-by-four, cut diagonally so that the very top is about half an inch thick. Traditionally, the striking surface of the makiwara consisted of a bundle of straw with rope tightly wound around it at the top foot of the board. A piece of sponge rubber, two inches thick, four inches wide and one foot long, covered with canvas or leather, is widely used. Anything that cushions the shock of impact can be used. For example, a tightly bundled t-shirt attached with duct tape would work just as well. Regular use of a makiwara will develop strong technique and is an excellent way to get the feel of karate techniques applied to an actual target, rather than into the empty air. It gives practice in focusing, muscular control, breath control and as a by-product, will toughen the skin of the knuckles and other striking points. 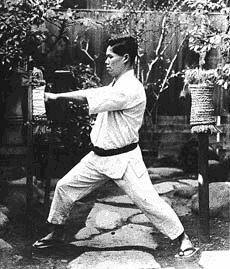 Because it is difficult to master the technique of focus (concentration of strength at the moment of impact), many karate experts feel that the techniques of those who don't use the makiwara are bound to lack power. Dig a hole in the ground three or four feet deep. Place the wide end of the board in it so that the top is at a height near the top of your chest. Pack the bottom of the hole with stones, bricks or concrete. Place 2 two-by-fours as shown in the diagram to brace the makiwara. Fill in the rest of the hole with dirt. The top of the board should move five or six inches without exerting too much pressure. Having a board too flexible is better than not flexible enough. Attach the striking surface near the top of the board so that the center of the striking surface comes to a height even with your solar plexus. The makiwara is used mainly for practicing hand techniques, although foot techniques are sometimes practiced as well. Ideally, a second, more sturdy makiwara would be used for foot techniques. Pay strict attention to good form, including proper balance and hip rotation. In most cases, the point of focus is about two inches on the other side of the board when it is stationary. At the point of impact, sharply let out a short breath, breathing in while withdrawing. This gives good training in breath control. In hand techniques, take care to strike correctly with the knuckles of the fist while keeping the wrist straight. There will be a tendency for the hand to glance off at first, but constant practice will correct this. Beginners should start with 20 to 30 punches per hand and slowly work their way up. Makiwara training may cause injury to certain individuals. Makiwara usage is not recommended for adolescents while their bones are still developing. The bones in a young person are not hard enough to withstand the stress placed upon them by this type of training. Use at your own risk!